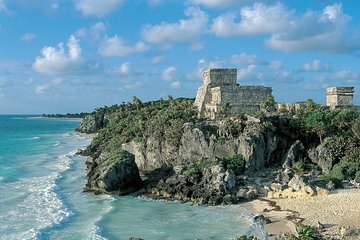 Spend a full day exploring the highlights of the Riviera Maya on a small-group tour that takes you to Coba, Cenote Choj Ha, Tulum, and Paradise Beach. Take a refreshing swim in the fresh waters of Choj Ha Cenote; learn about the history and archaeology of Tulum; and relax on the sands of Paradise Beach or splash in the Caribbean Sea near the ruins of Tulum. Your guide shares commentary about the Yucatan region with your small group, which is limited to no more than 15 participants.